You may sign up for one or both contests. $20 for 1st hand and $20 each additional hand. All times are subject to change. Every effort will be made to contact you if something changes AFTER you have paid your registration fee. Limit One (1) t-shirt per registered rider, regardless of the number of hands played. All T-Shirts are on a first come first served basis unless you are pre-registered. Only pre-registered riders are guaranteed the t-shirt size of their choice. Pre-Registration forms must be submitted no later than midnight CST Friday September 19, 2014. Pre-Registration will be closed at that time. 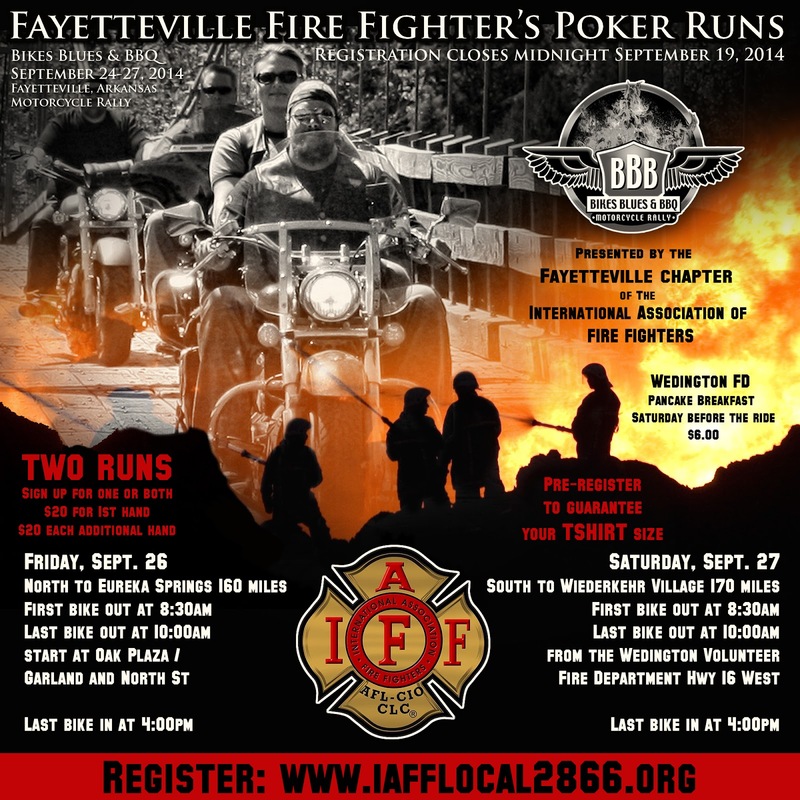 All Pre-Registered riders are encouraged to come to the Fayetteville Fire Fighters Association Tent located at the corner of Dickson & West Streets starting at 5:00 pm Wednesday September 24, 2014 and pick up their free t-shirt and welcome packet. On site registration will start at the same time. The day of the poker run you are riding in all riders are to check in at the Fayetteville Fire Fighter's Association Poker Run Tent at Oak Plaza at the intersection of Garland and North St across from the Harp's starting at 7:30 am Friday, September 26th, 2014 for the Eureka Springs Run and at The Wedington Volunteer Fire Department starting at 7:30 am Saturday, September 27th, 2014 for the Wiedeker Village Run to receive your map and playing hand for that day. Playing hands will not be available before that time. Custom blog design by Aponi Studios © 2013-2016 BIKES, BLUES & BBQ. ALL RIGHTS RESERVED. Bikes Blues and BBQ Events! Bikes Blues and BBQ Here We Come! All content contained within this blog is the property of Bikes, Blues and BBQ and/or its contributors. Articles may be shared intact with a link back to this site and proper credit to Bikes, Blues and BBQ and its contributors provided. Sharing, copying or downloading portions of articles, including photos, graphics, text or references, for any other purposes is not allowed without permission from Bikes, Blues and BBQ.